I've been busy this spring with a bunch of new mud/obstacle races. They were all in the 5K variety. Warrior Dash and Rugged Maniac are the big daddies in this arena. I did those last season and reviewed them here. This post starts my reviews of this season's races. What makes it different: No niche, just a standard mud run. Did it live up to its marketing: They promised you'd get wet and muddy. We did, so yes, it was exactly what they were selling. The course: Good. Pretty surroundings, obstacles spread out at good intervals, made use of natural obstacles with the mud and some hills. Obstacles: The usual - little walls, little mud puddles. The unusual - a huge tube/tunnel/slide into a water pit. The bad - Many of the obstacles were lame. The wait for the tube/tunnel/slide was way too long. We ended up skipping it because it was too cold standing still when you were wet. The good - FOAM! The foam wall was higher than my head! Crazy mud on the edge of the lake that was springy and dense and weird and fun. The obstacles for the first 2/3 of the race were rather boring. The end of the course had a bunch of mud pits one after the other so that was fun. Organization/Logistics: OK. This wasn't the kind of run where you could go for time, too many people in too small a space. It was a really big race and with the exception of the backup at the tunnel/slide, everything went as smoothly as could be expected with such a crowd. Fun Factor: Mediocre. The foam was great. 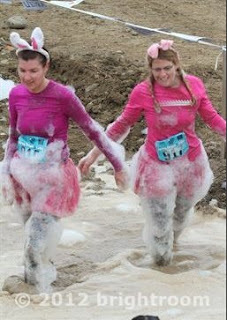 Running with my friend Nicole was super-awesome. This was her first race and a good one to start out on. The obstacles weren't too hard, maybe even too easy. We went straight from this race to the Great Urban Race Santa Monica, so overall a really fun day. Would I do it again? Probably not. One, it's in California. Two, it was fun once but nothing special enough to do again, unless I was in town and it was free. What makes it different: Two courses, one is harder and one is easier. Dogs and kids welcome on the easier course. Also, they allowed you to pay for one course and then go do the second course free! Did it live up to its marketing: Well, dogs were allowed but there weren't two different courses and as far as I could tell there were not easy/hard versions of the obstacles. Obstacles: The usual - hay bales and tires. The unusual - swinging ropes to cross. The bad - a dry tarp to crawl under. The good - an awesome zip line, a huge mud hill to climb and the the best mud pit in Arizona. unnecessary running to make the course longer. Volunteers didn't know anything. No difference between the easy course and the hard course that we could see. No water on the course for earlier waves, one water stop for our later wave. Organization/Logistics: Terrible. There was no one at the start line for our wave. We didn't even know which way to run - there were obstacles in three different directions. Apparently the bibs didn't arrive in time, the water stations weren't set up in time, some of the obstacles weren't complete in time. It was so bad that they turned off comments on their facebook page and erased all the bad things people were saying. Fun Factor: I have to say, it was SOOOO FUN! After we got over the major annoyances of the course not being marked and not knowing what we were supposed to be doing, we had a blast. Our plan was to do the hard course first then go back with Frankie and the Fabig kids and do the easy course. We made up our own route and did most of the obstacles on the first run through. We skipped two that were far away after finding out they were more hay bales. The fun obstacles with the water and the mud were at the end, so we took the dog and the kids and did the race backwards the second time. Frankie has so much fun! Would I do it again? Absolutely! They are going to try it again on September 15th and I'm in! I'm going to coerce Pat or another dog-less friend to go so Georgie can come too. They are currently offering half off team registrations, so the price is right. He REALLY loved the mud mountain! Frankie thought it was fun to jump over the irrigation ditch. Swinging ropes - this was my favorite! The zipline ended in a big water pit.